Steve Simich of Napa Marble & Granite Works checks the progress of a grave marker that is being sandblasted. The family-owned business is celebrating 70 years in the Simich family, currently operated by Steve and his wife, Margaret. Steve and Margaret Simich of Napa Marble & Granite Works are celebrating the family’s 70 years in business. Steve Weeeds” a stencil at Napa Marble & Granite Works on Monday morning while preparing a marker for sandblasting. A finished marker, foreground, is seen next to a similar 12-by-24-inch piece of Georgia gray granite on Monday morning at Napa Marble & Granite Works. Steve Simich cuts a stencil at Napa Marble & Granite Works. Anyone traveling on the city’s east side can’t miss Napa Marble & Granite Works. Perched on a triangle-shaped lot overlooking a busy five-way intersection bisected by Silverado Trail, the business, which makes headstones and monuments, has been owned by the Simich family since 1946. For the past 70 years the family managed to carve out a business helping Napans remember their loved ones in a very permanent way. Napa Marble & Granite Works is actually much older than 70 years. According to Stephen Simich, the current co-owner, James Newman started the business 138 years ago, in 1878. The second owner was A.V. (Albert Vernon) Smith, who eventually sold the company to Myron and Marjorie Simich, Stephen’s parents. The shop has been located at 9 Coombsville Road for about 90 years, they believe. Simich’s father, Myron Simich, a granite cutter and artist, immigrated to the U.S. from Yugoslavia in the early 1900s, recalled Stephen Simich. “We all grew up working here, sweeping the shop, pushing the broom,” he said. Around 1980, Stephen Simich and his brother David took over the business. His father passed away in 1985 and his mother in 2013. David Simich recently retired. To this day, only family members work at the business. “Communication, understanding and patience” are the secret to working together, said Margaret Simich, Stephen’s wife. Each person makes a contribution. Stephen Simich produces the monuments and headstones. Margaret Simich helps customers choose and design monuments and manages the office. Son Nick, 22, attends Napa Valley College and does some computer work for the business as well as sandblasting and installations. Daughter Audrey, 19, also attends Napa Valley College and helps her father install the monuments, as well as moving the stones around the open-air workshop with a forklift and sandblasting the designs. Margaret Simich said customers who need a headstone or monument usually start by picking the color of the stone, then the source country, the size and shape, and finally wording and graphics. Inside and outside display areas provide examples of the granite, marble and limestone. The stone comes from U.S. quarries in California, South Dakota, Georgia, South Carolina, Missouri and Texas, as well as India, China, Canada and Norway. The spectrum of colors includes blues, reds, grays and even greens. Long ago, monument makers like Myron Simich cut the images and words on monuments and tombstones by hand. Today, templates are created via computerized plotting machine. The machine cuts the outline of the text and design work onto adhesive-backed templates. Those templates are then pressed onto the stone. Next the letters and images are peeled off. The stone is then sandblasted. After removing the template, only the words and images remain etched into the stone. “He was old school. He wanted to do something that was one-of-a-kind,” his son said. Many stones come from the quarries partially cut or finished, but some of the cutting and polishing is still done as it has been for years, under an open-sided workshop with a view of the busy intersection below. Even though computers shape the lettering and designs they produce today, that doesn’t mean that Napa Marble & Granite Works produces cookie-cutter work. 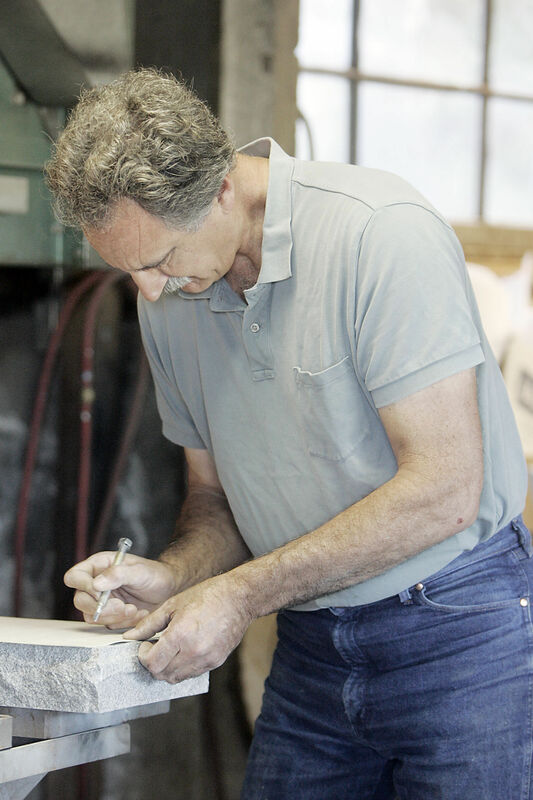 Each stone or monument is personally designed and finished at the shop. “I try to find a story about the person and transfer it to stone,” said Margaret Simich. “A monument is one of the last things you get on earth.” Customers want it to reflect the life of their loved one. During a recent tour, Simich showed the diamond-tipped cutting blades used to cut the stones, along with a modern sandblasting machine. Nearby stacks of monument stones awaited inscribing, along with other projects ready for delivery. Pieces of metal salvaged from old advertising signs are still used as templates to shape the edges of some stones. A remnant of an old blacksmith shop with a forge and anvil has been preserved. Simich also does repair work. Several old tombstones dating back to the 1800s that had broken into pieces had been glued back together using epoxy. Leftover stone pieces from former projects have been cemented into place to form a retaining wall along one side of the property. The family grew up in one of three houses located behind the business shop. Today, tenants occupy the homes. The 3-acre parcel backs up to Tulocay cemetery. The Simiches believe that’s probably why the previous owner chose that location. Stephen Simich estimated that about 90 percent of the headstones and stone monuments at the cemetery were created by the business. The amount of work at Napa Marble & Granite Works varies month by month but Simich estimated the company produces about 200 monuments a year. Not all are for grave sites, he said. They also make house number signs, benches and items such as historical markers. In the ‘90s, the company also cut pieces of granite and limestone for the exterior of the General Services Agency administration building in Oakland plus other buildings in San Francisco, Oakland and San Jose. Today, prices for a monument or headstone range widely – from several hundred dollars to several thousand. Most people spend anywhere from $1,000 to $3,000 on a monument, said Margaret Simich. The couple said they attributed their success to sticking with what they know and do well. They considered expanding at one point, but decided against it. “You’d get spread too thin,” said Stephen Simich. “It’s very exciting” to have reached such a 70-year milestone, said Stephen Simich. “I’m very proud of what Steve has done and what his family started,” his wife said. Regardless of what happens in the future, the family already has one thing planned — their own headstones. “We have a plot in St. Helena,” Stephen Simich explained. It features a 6-foot-long family monument in the shape of a tablet surrounded by a short granite wall. Each grave-site marker is a smaller piece of black granite, quite understated, especially since they come from a monument maker. “We wanted to keep it simple,” he said.